Oblique aerial view centred on the remains of the fort and dun with lazy-beds and township adjacent, taken from the NW. Oblique aerial view centred on the remains of the fort and dun with lazy-beds adjacent, taken from the ESE. 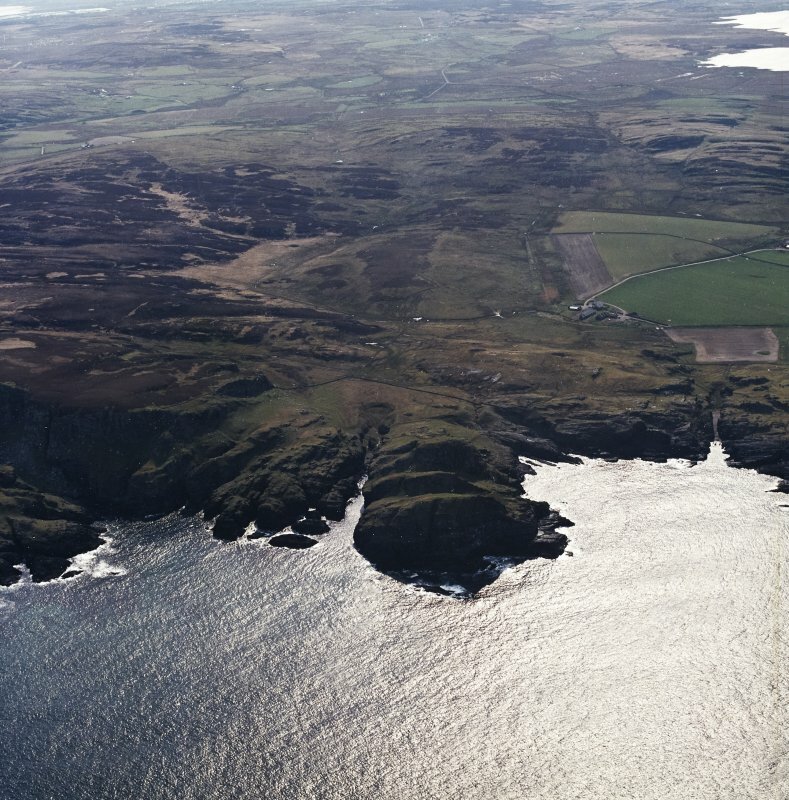 General oblique aerial view of fort at Dun Bheolain, Islay, taken from the WNW. Oblique aerial view centred on the remains of the fort and dun with lazy-beds adjacent, taken from the SE. Oblique aerial view centred on the remains of the fort and dun with lazy-beds and township adjacent, taken from the WNW. 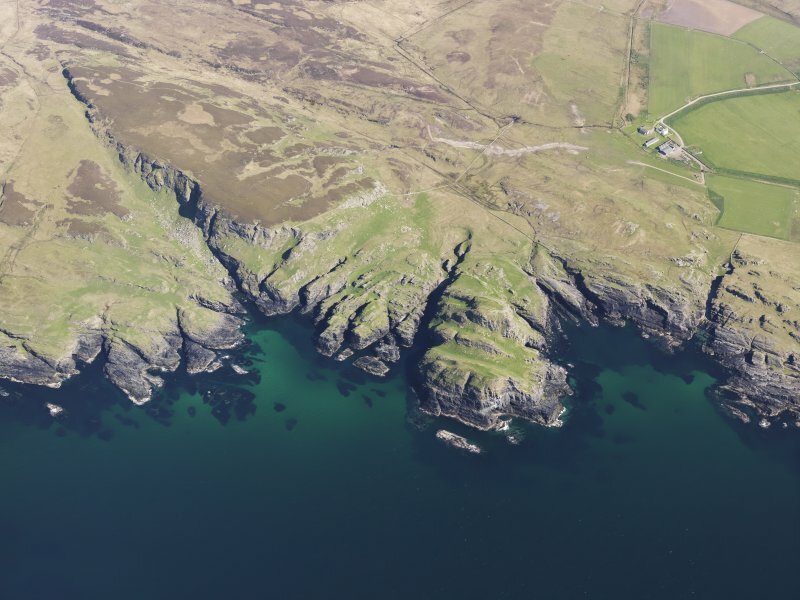 Dun nan Nighean (name not verified) is a poorly preserved dun (information from RCAHMS to OS) situated on a small coastal rock promontory. Only the fragmentary outer wall face is visible (up to 10 courses on NE) consolidating the rock face on the NE, SW and SE sides and an intermittent basal course on the NW side. There is no inner wall face visible nor any walling standing above the interior level. The overall dimensions would appear to be approximately 23.0m. NW-SW by 14.0m. There is no entrance evident; however, several rock-cut steps approach the dun from the south-east; these are consolidated on the north side by fragmentary wall facing built on to the living rock. The cup mark noted by Newall (1963) is indistinct and probably natural. Situated 12.0m outside the dun on the seaward (NW) side a 0.5m sub-circular hole in the turf leads to a sub-oval underground chamber. It is 2.0m by 1.5m built of roughly dressed stone walling with a corbelled slab roof. Its purpose is not clear but it would appear to be associated with the dun and is probably a refuge or store. Visited by OS (T R G) 23 May 1978. T Pennant 1774; F Newall 1963; F Celoria 1959. 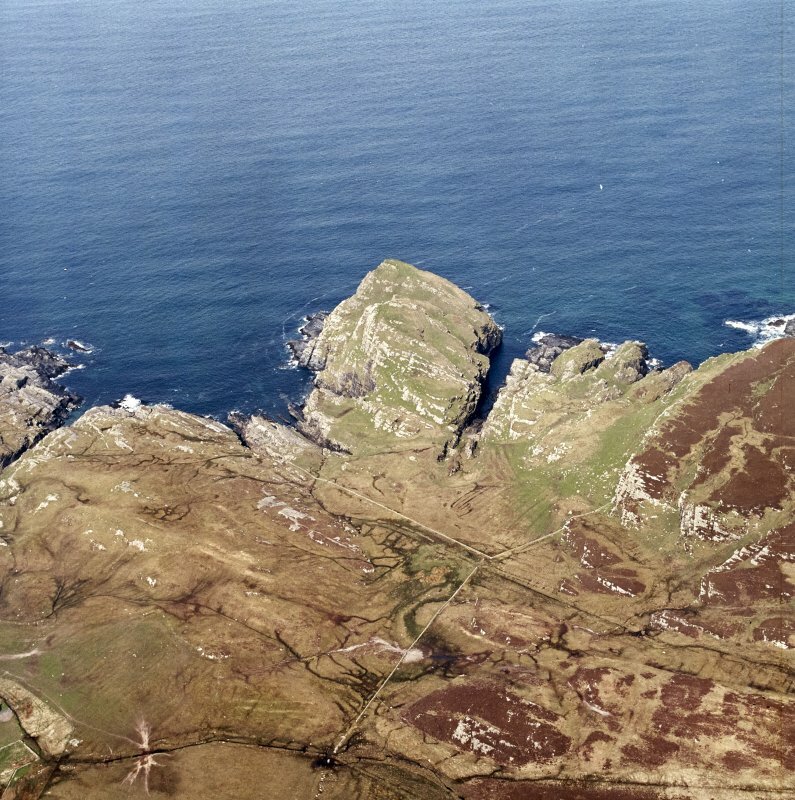 Smaull farmhouse and immediately N of the fort Dun Bheolain (RCAHMS 1984, No. 144). 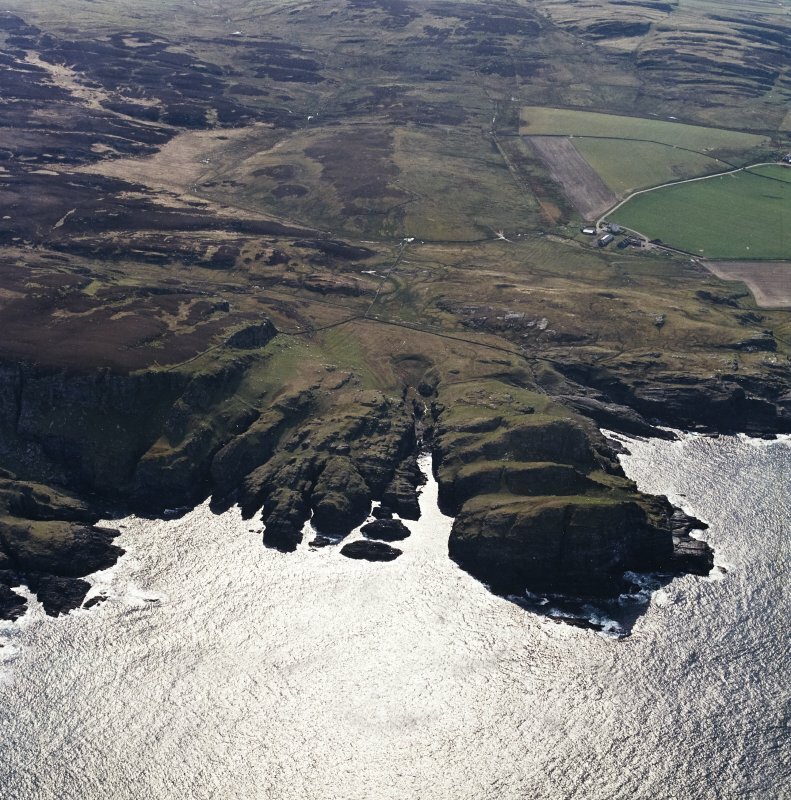 The boss rises about 8m above the promontory neck, thus commanding the approach from the SE, or landward side, while the flanks and nose of the promontory present steep or vertical rock faces falling as much as 25m to the sea. The dun measures about 17m by 15m within a single drystone wall drawn round the margin of the summit area. can still be traced: the best-preserved sectors are situated on the NE, where the face stands 1.6m high in ten courses; other well-preserved stretches may be seen on the S and SE, and at the latter the lowest course is set as much as 5m below the level of the summit. The course of the outer face on the SE may perhaps be explained as an attempt to extend the wall across the entire width of the summit, so as to deny access, at the upper levels at least, to the rest of the promontory. It is uncertain whether the singular plan thus produced in this sector, which contains the entrance, may not also derive from the intention to build a 'gatehouse' comparable in function with structures observed at certain prehistoric fortified sites in the Northern Isles' (Hamilton 1968) and elsewhere in Argyll 2 (RCAHMS 197, see Introduction, p. 24). The presence of a line of earthfast stones in the body of the wall S of the entrance, possibly the inner face of an intramural gallery or cell, makes the latter explanation inherently more probable. On the other hand, the apparent discontinuity in the line of the outer face in the middle of the s side was probably occasioned by the need to found the wall securely on the crest, and not the steeply sloping face, of the rock outcrop that obliquely intersects the line of the dun wall at this point. fractures in the schistose bedrock but, even so, the quality of the work is exceptionally high. Only three or four steps of the lower flight survive, all in a poor state of preservation. The upper flight, set at right angles to the first, comprises five evenly spaced steps, the risers averaging about 0.2m in height. The middle tread of the upper flight and the highest tread of the lower each bear a single cup-marking: the upper example measures about 60mm in diameter by 25mm in depth, the other, being much more worn, only 30mm by 10mm. stands 1.2m high in seven courses. The second, which sprang from the base of a rock face below the dun on the sw, has now been reduced to a single stretch of outer facing-stones and a grass-grown scatter of core material; its purpose was presumably to bar access to a narrow sloping terrace which offered approach to the summit from the base of the cliffs on the SE. 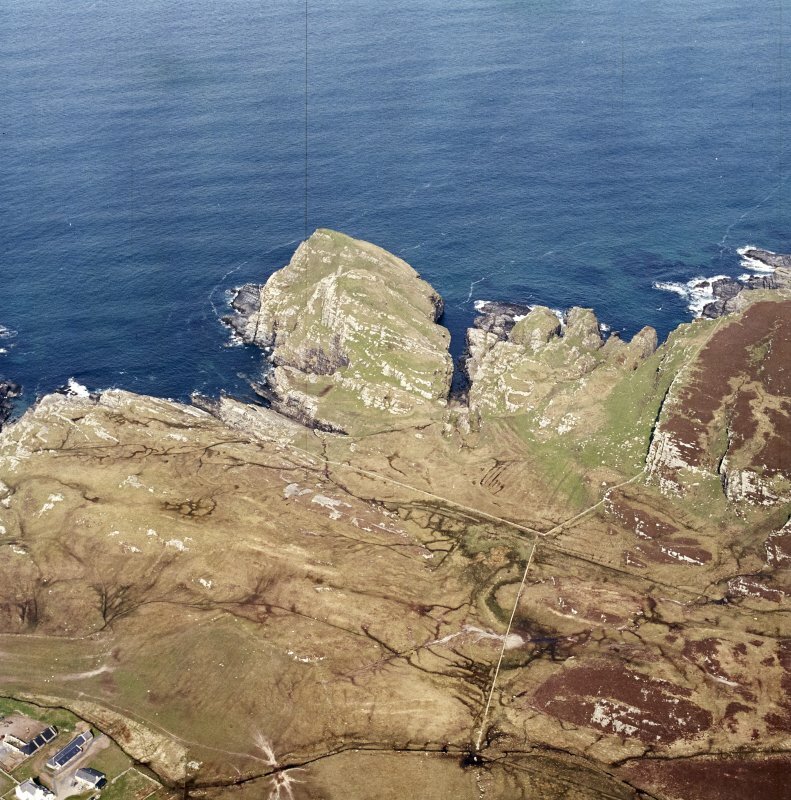 RCAHMS 1984, visited May 1979.